I write a market report for a local produce company that I used to work at full time prior to attending culinary school. It’s a quick job that takes me a couple of hours on Wednesday afternoons and pays me just enough to keep me from feeling like a total slacker. I get first-hand knowledge of all things produce related from the guys in the company buying office, sometimes including free samples of things. One of the buyers, Mark, sent me this article about the nutritional power of the Banana, and I loved it. You must read it too, if only for the funny part at the end about the monkeys. Thanks Mark! I do want some of that organic chevre too! help overcome or prevent a substantial number of illnesses and conditions, making it a must to add to our daily diet. Overweight and at work? Studies at the Institute of Psychology in Austria found pressure at work leads to gorging on comfort food like chocolate and chips. Looking at 5,000 hospital patients, researchers found the most obese were more likely to be in high- pressure jobs. The report concluded that, to avoid panic-induced food cravings, we need to control our blood sugar levels by snacking on high carbohydrate foods every two hours to keep levels steady. Smoking &Tobacco Use: Bananas can also help people trying to give up smoking. The B6, and B12 they contain, as well as the potassium and magnesium found in them, help the body recover from the effects of nicotine withdrawal. banana skin, and rub directly on the shoe…polish with dry cloth. Bananas….Amazing fruit !! I’m so gonna try that hangover cure! I plan to use the first skin to polish up my natty winter boots! on March 10, 2007 at 2:01 pm Susan from Food "Blogga"
Wow, looks like I’m never going to have any health problems! I eat 1-2 bananas a day! They are the perfect post-workout snack and travel food. When I buy them at Trader Joe’s, the check out person usually askes how many kids I have because I buy so many! None. It’s just me and Jeff and our 13 bananas. 😉 Thanks for the great post Kate! Bananas are my all time favorite fruit. They are so easy and convenient to eat and taste great. I can’t believe all the other great benefits of bananas. Very cool post, thanks! No reason? Does it do something to the nutritional value or taste? They do freeze them with a chocolate coating for a summer treat (sold at fairs and festivals). Also, I have refrigerated a banana before it gets too ripe. The outer peel turns black but the banana on the inside stays firm and does not over ripen. I always read to do that … and it is also a good way to keep the banana longer if you are making banana bread. Just curious … is someone can answer why? 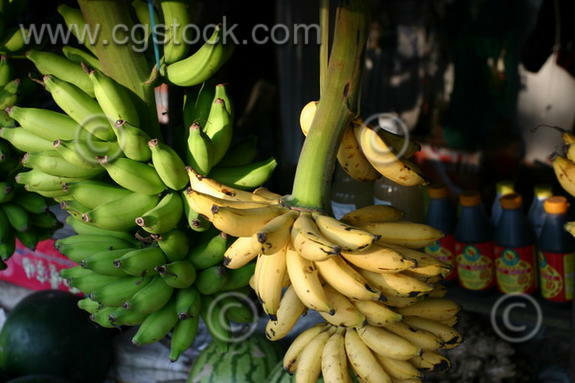 A ripening banana converts the starches in the fruit to sugar. By chilling the fruit, the process is stopped and the fruit doesn’t ripen anymore. It’s fine, I guess if you want to keep them at a certain level, or like cold bananas. They just shouldn’t be kept in the refrigerator until they have ripened to the desired sugar level. Bananas taste the best and are the best for you. You can eat them in a pie, aye! It’s impossible to beat them. So you should never put bananas, in the refrigerator! Oh no no no, no no no! An average banana weighs 6 ounces and costs 19 cents. This information supplied by Edna, Gail, Michaela, Olivia and Zoe from Seward Middle School, Minneapolis MN USA. I always have been a bananna freak. So I am in good company. These facts aren’t just ofund on this site. They are everywhere. I still don’t understand that fact about putting a banana in the refrigerator. But… interesting stuff. First, I love Banana and after reading this passage, my love for it increasing. So thank you for letting me know the facts about BANANA………. How is the best way to keep bananas from ripping too fast. My father will sometimes eat 5 bananas in a day, but it tends to make him dizzy – why ?? Thanks, I set out to find this exact info today and found it right away! Oops! Guess what? We’ve moved!! !